I never get tired of roasted vegetables and usually serve some sort of roasted veggie several times throughout the week. Today I was making a chicken casserole recipe for dinner and decided to pair it with roasted veggies. I went to the refrigerator to see what I had on hand and found some broccoli, green beans, grape tomatoes, onion, lemon, and parmesan. I tossed all of the veggies together with olive oil, sea salt, freshly cracked pepper, and crushed red pepper then roasted them until fork tender and perfect. 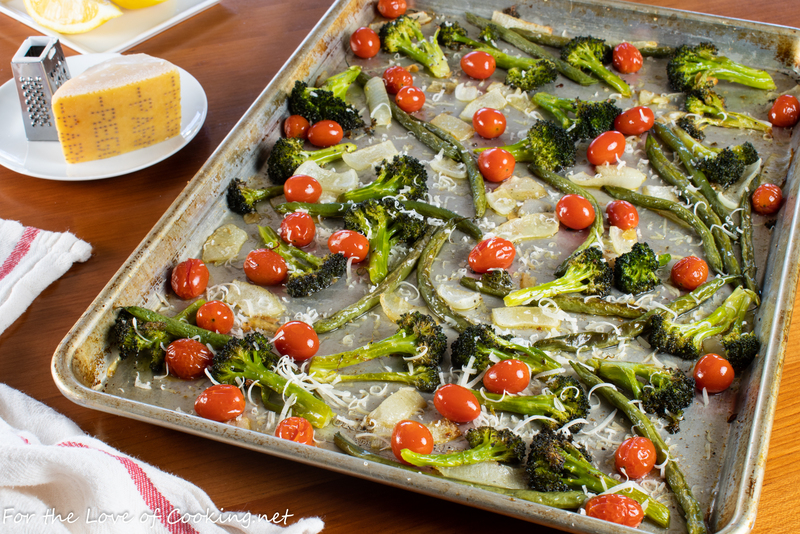 This sheet pan roasted broccoli, green beans, and tomatoes with lemon and parmesan was a light, healthy, and delicious veggie side dish that paired nicely with our casserole. 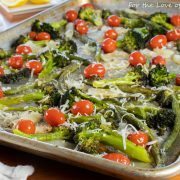 Toss the broccoli florets, green beans, tomatoes, and onion with the olive oil then season with sea salt, freshly cracked pepper, and crushed red pepper flakes, to taste. Toss to evenly coat. Pour all but the tomatoes on the sheet pan. Place into the oven and roast for 15 minutes. Add the tomatoes and slivered garlic then continue to roast for 10 minutes or until the veggies are fork tender and the tomatoes are ready to burst. Remove from the oven. Squeeze a fresh lemon wedge over the veggies then top with freshly grated parmesan. Serve with additional lemon wedges and Parmesan. Enjoy. 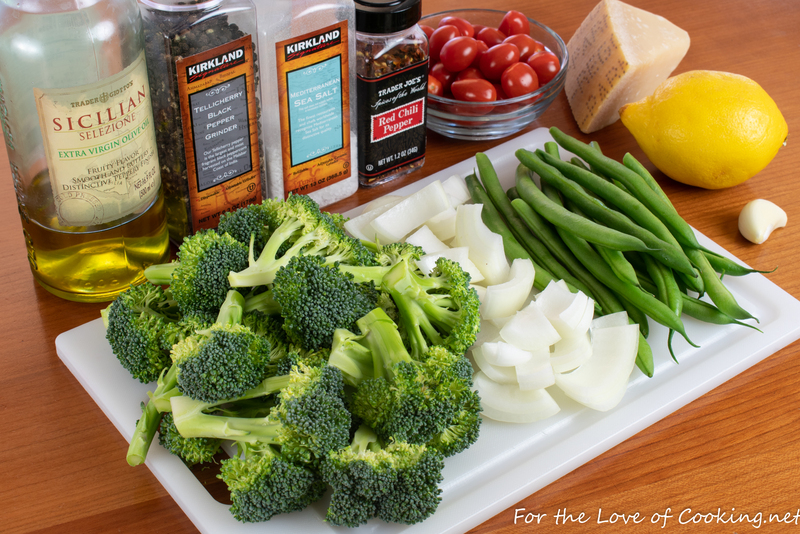 Toss the broccoli florets, green beans, tomatoes, and onion with the olive oil then season with sea salt, freshly cracked pepper, and crushed red pepper flakes, to taste. Toss to evenly coat. Pour all but the tomatoes on the sheet pan. Place into the oven and roast for 15 minutes. Add the tomatoes and slivered garlic then continue to roast for 10 minutes or until the veggies are fork tender and the tomatoes are ready to burst. Remove from the oven. 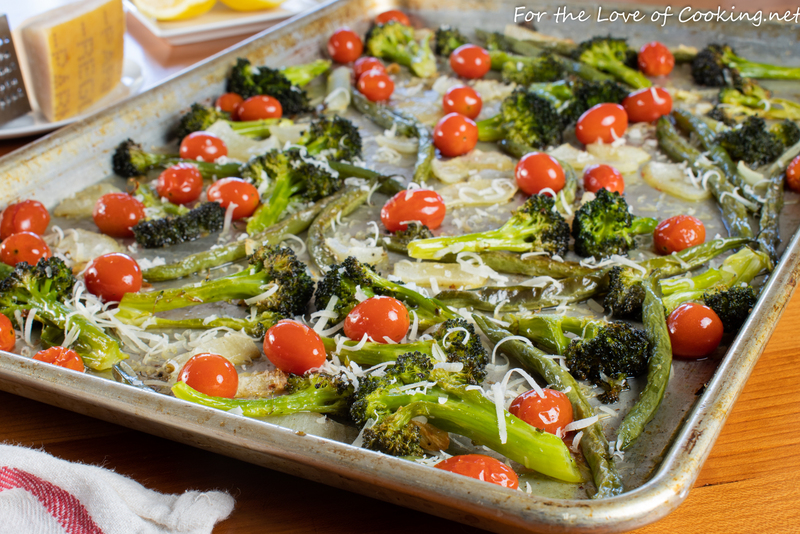 Squeeze a fresh lemon wedge over the veggies then top with freshly grated parmesan. Serve with additional lemon wedges and Parmesan. Enjoy. My favourite way to prepare the veggies is to roast them! Yummy! I love roasted vegetables also and these look delicious. This must have been delicious! I love the idea of topping them with the Parmesan! Roasting veggies…so simple to do and they taste so good. I love roasted veggies so much I could eat them as a meal unto themselves. Love how you’ve made them a bit more special here!